Love is like a perspective that one has towards the other, no matter what the visual is. Irrespective of how the other half is, there are sometime ulterior motives that need to be achieved in the disguise of love and belonging, but not everyone has the power to see through that. For those, who possess this power they are either smart enough to escape or completely change the person with true love as it has the power to do so. There are a lot of fables that have already been written about how true love has made people do crazy things and survive, how the universe gets along in making sure that the two souls become one. But the question is still remains the same, how does one realize if the love that they are in, is true love? I recently read Rightfully Wrong Wrongfully Right, a book by author Varsha Dixit, who has previously written books like Xcess Baggage, Only Wheat Not White, etc... 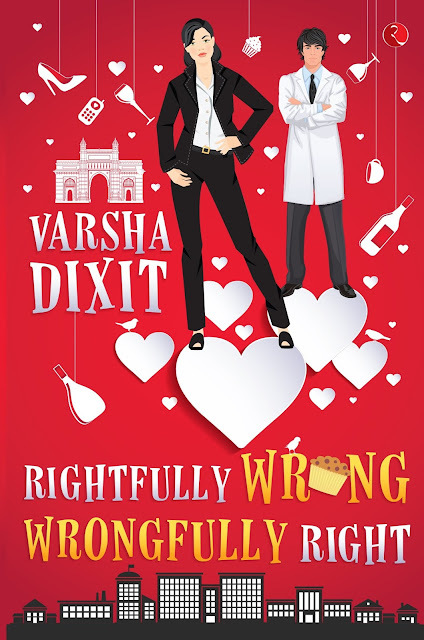 Rightfully Wrong Wrongfully Right is the third book of the Right Wrong series by Varsha Dixit, while the first two were Right Fit Wrong Shoe and Wrong Means Right End. The book Rightfully Wrong Wrongfully Right is about the story of two individuals, Gayatri and Viraj, not completely opposite of each other but quite different from each other. Gayatri, is a modern day rich girl who wants to break free, but her father wants to keep everything under his control and wants her to get married to a rich guy that he has selected. On the other hand, Viraj is a young scientist who is most of the times in his own world doing weird things. The two distinct personalities, who disagree on almost everything, who are not meant for each other, not even virtually, call it destiny or a plan, come together by starting to work at the same place. As in arithmetic, the two negatives make a positive, can the coming together of these two wrongs make something right? That's the question which is answered through the story here. The story plot of Rightfully Wrong Wrongfully Right is set in the modern day, filled with confusions and careers, haste and love, belonging and betrayals, all the characters and subplot finely take you through it. The 278 page long, Rightfully Wrong Wrongfully Right, is smartly divided into 45 small chapters that make reading easier and thus keeping the subplots linked and the entire story intact without a much back and forth. The cover design of the book is catchy, apt and in tandem with the modernity of the book and it does give you some hint about the characters right away. The characters are nicely built through and are a mix of being usual and unusual throughout. There are minute detailing of the scenes and the characters being done, which is good, but I felt that it made the story a bit lengthier and predictable, though there is some kind of newness in the overall plot. The love, coming together, wrongs being right, is very delightfully narrated. The book also has some light moments beautifully coupled with good humor. The other aspects of the book like overall narration is good, the story line is predictable, but interesting, the plots and sub plots are new and with a different perspective. I would recommend this book to anyone interested in reading romance genre. Thank you for a very articulate and honest review. Much appreciated.